Like many Hoosier Catholics, bishops across Indiana were overjoyed to learn on Oct. 9 that Pope Francis had chosen Cardinal Joseph W. Tobin as a member of the College of Cardinals. 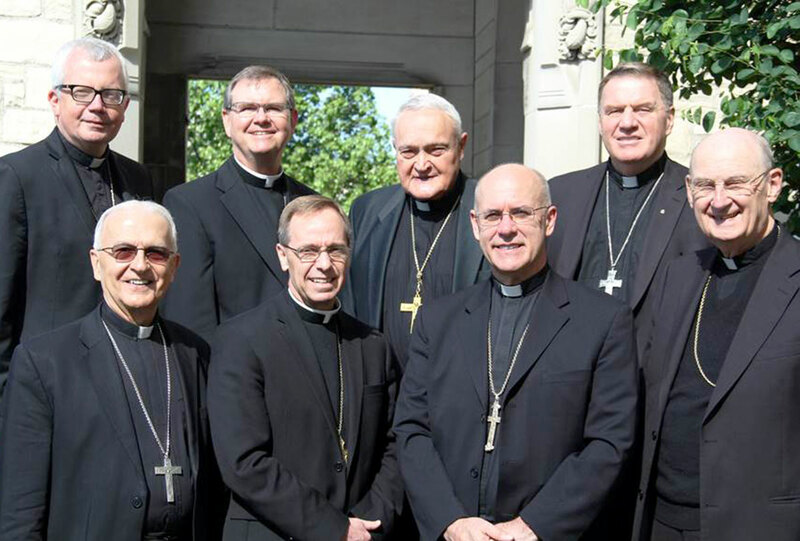 About a month later, these leaders of the Church in Indiana also shared in Hoosier Catholics’ sadness at seeing Cardinal Tobin appointed to lead the Archdiocese of Newark, N.J.
Bishop Charles C. Thompson, shepherd of the Diocese of Evansville, Ind., said that Cardinal Tobin’s “legacy of leadership is ultimately about leaving the footprint of Pope Francis on the Church in Indiana. “His example of servant-leadership is marked with a humble spirit, gracious hospitality, a keen intellect and prayerful presence,” said Bishop Thompson, who was appointed to lead the Church in southwest Indiana in 2011. “His calm and gentle way allows all to feel welcome and valued in his presence. Remaining Christ-centered in all situations, he is able to avoid getting pulled into any particular ideology. Bishop Donald J. Hying of the Diocese of Gary, Ind., said he values Cardinal Tobin’s “joyful humanity in radiating love and goodness. Bishop Kevin C. Rhoades of the Fort Wayne-South Bend, Ind., Diocese said Cardinal Tobin “has been an exemplary witness of the bishop’s vocation to be a witness to Christ, the Good Shepherd. Bishop Rhoades hopes Hoosier Catholics will benefit from Cardinal Tobin’s example in the future. Bishop Timothy L. Doherty, who has led the Lafayette, Ind., Diocese since 2010, said Cardinal Tobin has been a leader for Catholics across the state “by his personal thoughtfulness and not authority. He also pointed to the Indiana bishops’ pastoral letter on poverty as an important legacy that Cardinal Tobin leaves behind as he prepares for ministry in northern New Jersey. “I think that the key word is ‘cooperation,’ ” Bishop Doherty said. “The lesson flows from our baptism when we are charged to share … with Christ in acting as priest, prophet and king. Holy relations with God, teaching by word and action, leadership infused with wisdom and mercy.